It is no surprise that when a ranking of Canada’s 100 best workplaces was recently released, that Google and AOL Canada (Large and Multinational Category) held on to the their top spots in the annual study by The Great Workplace, which is a global research, consulting and training firm. However, these types of studies usually mean nothing to an entrepreneur who is self employed with a much smaller business and staff. What should a small business owner do to ensure that he or she is providing a great place to work for themselves or any employees they may have? A research study may or may not exist that reveals what makes for the best small business workplaces – or even a list of the best small businesses to work for. However, there is plenty of information on the Internet to help a small business make its workplace better and more employee-friendly. There are plenty of blogs, forums and anecdotal comments on discussion groups that can provide ideas on making your small business workspace a better one. To some extent, workplace quality is shaped by your business type and revenue model. For example: your employees’ needs in order to do their work comfortably and effectively; your employees’ expectations of their workspace; and your future workspace requirements, needs and growth expectations. These considerations can enable your business to provide a better workplace environment. Are you a professional who comes to your customer’s home to provide a service or product? Does your business or employees require a storefront? Where will the product or service be delivered? 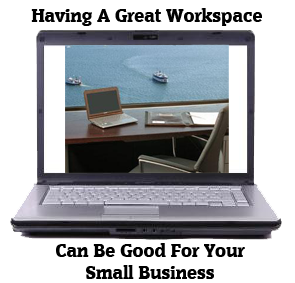 Will your business or employees require message and mail support for telecommuting and “roaming” employees? What degree of security will you require as the business grows? What age groups and gender mixes does your business attract? As mentioned above, the industry or type of business you are in will likely affect your employees’ needs and expectations. For instance, the expectations and needs of an employee in financial services will be much different than those working in technology. The financial services employee needs to keep client information private, and is therefore more comfortable and effective in a private workspace. An employee in the technology industry may often collaborate with others on a project. So, team or co-working spaces may be more effective and productive. This is the part of the process that is perhaps the toughest because you are trying to predict the future of your business. This will be more difficult if you have no business plan – but either way, at this point don’t let any current situation blur your vision of the future. Plan this part out as if you have the ideal plan in place. Nothing is more discouraging than a workplace where management has not anticipated growth – such as employees in crowded or noisy work spaces. The opposite is equally frustrating – underutilized work spaces resulting in poor morale and being poorly perceived by both employees and customers. Traditional office space and storefronts are the most susceptible to these problems, usually because of the terms and inflexibility of the agreements and spaces. When you are considering ways of making your small business office or workspace a better place, there are a number of things you need to consider – not the least of which is the style, concept and structure of your offices and workplace. What is the Business Value of Creating a Great Workplace? For some small businesses, deciding factors could be employee happiness; for others it could be more creativity and productivity. Still for others, the look and feel of your workspace can instill confidence in both customers and employees. Clients will see the dedication that you have to detail and how you have set up a workspace suited to better serve their needs . A well set up office workspace can also give employees pride in the company and their day-to-day working environment. Creating an idea for the type of office space layout you want for your workplace is probably the most important decision. But there are factors you must take into consideration when making those choices. If you are creating a workplace with employees in mind, you need to think of the generation you are employing and what type of work environment they are most comfortable and productive in. For example, millennials and baby boomers ideas of the best workplaces can be very different. Believe it or not, it seems that age and to a lesser extent gender, does play a role in the expectations of employees of their workplace. Millennials tend to prefer open-style workplaces that are collaborative in nature, similar to that of team space or co-working offices. The do not want to be stuck in a cubicle or share a small office with one or two other people. They want to be able to communicate with other staff without having to peer over a wall or leave a small office when they need a few feet of personal space. More mature employees such as “Generation X” or “Baby Boomers” are more likely to work better in small groups and prefer to have their own private office, regardless of size. So building an office space that best works for them might mean a workplace made up of several small offices and a dedicated boardroom for meetings – as well as places to work alone when there are no meetings and the boardroom is not in use. A key part to finding and building a great workspace is location. You need to know what location is best for your company image, how your customers will access you, and what works best for your employees. You can have the best and most awesome office space in the world, but if it is in the wrong location, your small business could suffer. Finding the right location is important because your office space location can be the key to your small business success. So you have a workplace concept and an idea where you want your office space located – but what about the building or local amenities nearby? Are there restaurants, places to entertain clients and places where staff can pick up quick snacks? Are there places nearby to get other business needs fulfilled – such as office supplies, custom poster printing or other things you may need in a pinch? These may seem trivial, but in the overall picture of what you need to make a great workplace, they do have their place. The type of workplace you keep can be important to the way your business flows and how your employees work within your office. Do you want to maintain the office so the employees take pride in it? Do you want your office to be transparent and communicative with a true open-door policy? Then you need to build your company structure so your employees fully understand and embrace it. Keep the communication and employee feedback flowing at all times. Why Does a Good Workplace Matter? If you have employees that are happy, they tend to be more productive and do a better job. Simple as that! Happy employees tend work for the same company longer. And employee retention is a real challenge in today’s workplace. The other thing about having long-term employees is that customers who deal with them build trust not only in these employees, but in your small business as well.